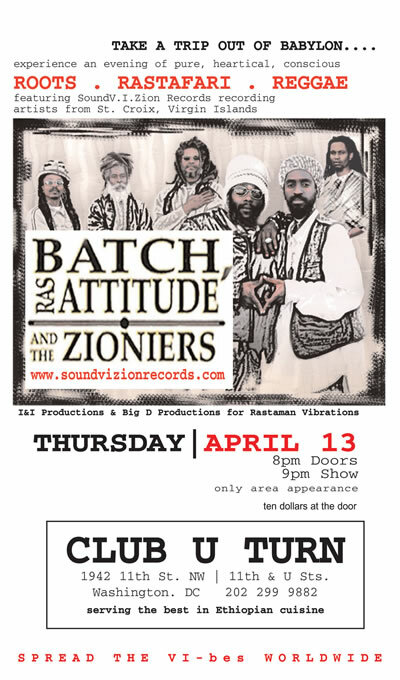 (Washington, D.C.) – It is seldom that we can all agree on what is musical greatness, but starting Thursday, April 13, 2006 through April 16, 2006, Washington, D.C., Virginia and Maryland reggae fans will have the opportunity to witness and enjoy the truly great talent of St. Croix’s Batch, Ras Attitude & the Zioneers. They are some of reggae’s finest emerging artists to come to the Washington Metro area in years! Batch is one of St.Croix’s most acclaimed producers, singers and musicians. After he founded SOUND VIZION Records (www.soundvizionrecords.com) in October 2000, he produced or co-produced many popular releases which include the popular compilations Culturellenium I & II, Mada Nile’s debut "Rise Today," Midnite’s "He Is Jah," Bambu Station’s single "Amadou Diallo," Ras Attitude’s "Happiness" and "Love Life" and Jerome Austrie’s debut gospel album "Love, Life, Spirit" which was nominated for several prestigious awards. While these accomplishments are worthy to note, Batch has also produced his own albums to worldwide acclaim. Songs from his albums "Who You Are," "Keep The Faith," and his newest release "Jah Guidance" can be heard online or on local stations in Germany, France, Brazil, Holland, the U.S. and Puerto Rico to name a few. Along with Batch will be Ras Attitude, one of the most versatile singers to have graced any stage in the Washington, D.C. area. From his DJ chants to his falsettoes, Attitude’s amazing singing voice is only matched by his upful presence and stage performance. Singing songs from his previous two albums and his newest release, "Holding Firm," Ras Attitude is surely one attitude not to be missed. Super performer and lyricist! ZIONEERS. ZIONEERS. ZIONEERS. It is with much respect we must highlight one of the most treasured bands from the Virgin Islands. While not receiving worl-wide acclaim, the ZIONEERS have trodded spiritually in the depths of the music from St. Croix to Puerto Rico since the early 90’s. Holding the band’s current foundation of drum and bass is the father and son combination of Ras Ibeshee and his son Ras Kwome. You WILL talk about them after you witness their skill level and vibes. Multi-instrumentalist and singer Ras Ibednego and keyboardist Sonny Andrews gives to the group the versatility and heartfulness that makes this one of reggae’s premier bands. Don’t let the lack of corporate advertisement dollars fool you. The fans at the 2005 Sierra Nevada World Music Fest says so. The folks in New Orleans says so. Chicago, California, North Carolina, Boston, Virginia, Florida and all the many places that have experienced this band says so. Each venue has it’s very own appeal and these artists are really worth seeing three times in one week, they are that good. Admission: $10 / Doors Open: 9pm sharp! Sunday, April 16th, The Norva with Jamaica’s T.O.K. Merchandise will be available for purchase at each show. Thursday and Saturday nights at U-Turn and Yabba Pot are expecting a large turnout so get there early. Take at least an hour to support the hardworking musicians that supports you. See you there.